More than 120 guests turned out for the 36th Annual UConn Cancer Research Golf Tournament on August 5. 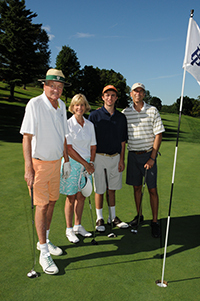 On one of the best weather days of the year, golfers fanned out across Tumble Brook Country Club in Bloomfield to have fun and raise dollars for the Carole and Ray Neag Comprehensive Cancer Center. The tournament raised nearly $130,000 to support the cancer center's DNA sequencing program. Scientists are investigating how cancer tissues differ from normal tissues, and ways to advance cancer treatment based on each individual patient's genetic makeup. With special guest Scot Haney of “Eyewitness News This Morning” and “Better Connecticut” on WFSB Channel 3 as auctioneer, the live auction had its best year since 2010. The event was generously supported by Diamond Sponsors Robert and Renee Samuels and Mark and Laura Yellin; and Platinum Sponsors Cigna, Richard and Jane Lublin, The Joe and Gay Sudarsky Foundation, The R. David Sudarsky Charitable Foundation, and The Travelers Companies. The UConn Cancer Research Golf Tournament has raised more than $1.7 million since it began.